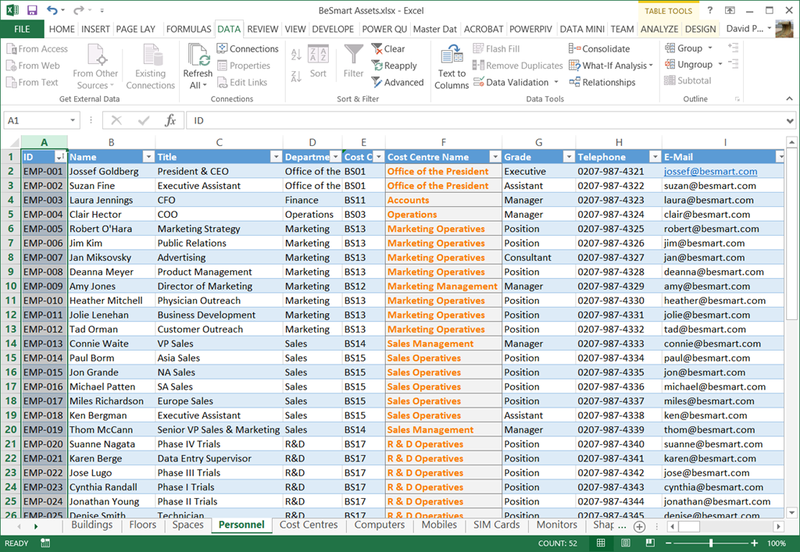 Firstly I have an Excel workbook that I have many worksheets with tables of data on them. I named each worksheet, and used the Format As Table command on each. 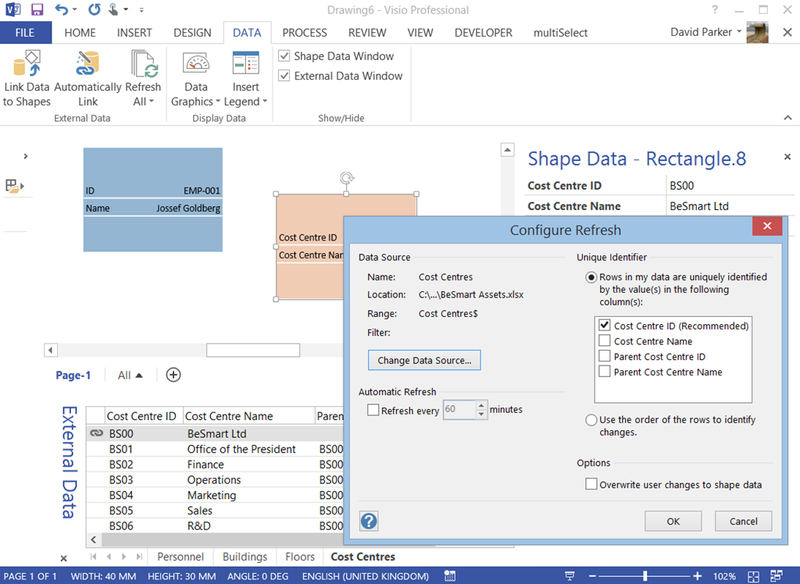 Then I used the DATA \ Link Data to Shapes … function in Visio to link to several of these worksheets as External Data recordsets. Each of my worksheet tables have a unique identifier column, which the Data Selector recognised. 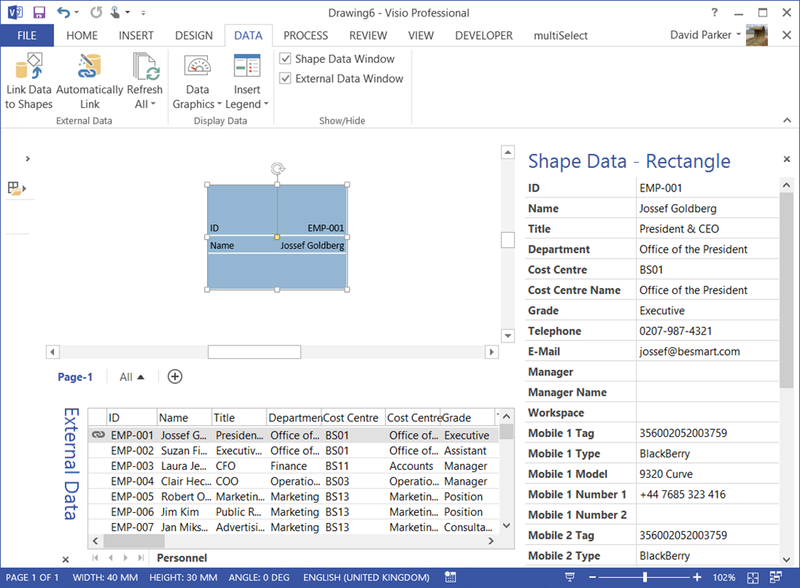 This created my first External Data recordset, from which I dragged and dropped a single row onto the Visio page to test. I then repeated the actions for several other worksheets in the same workbook. However, you cannot use the column selections and row filters with Excel workbooks saved to Excel Services, so I am ignoring this. I have a copy of the Excel workbook in an Office365 document library. 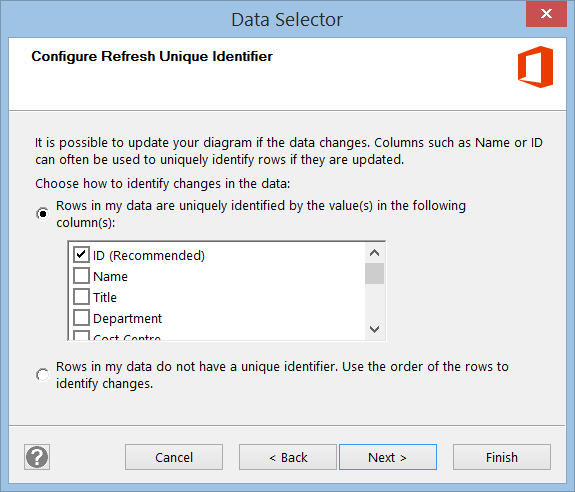 Visio does warn me that this action may break links to the data, but I know that it is an exact copy. I was a little surprised to see that the RangeName included the full address of the range, but then automatically refreshable Visio documents displayed in the Visio Web Access control in SharePoint pages does not support shape additions or deletions. I wrote a short macro in Excel to list the worksheets in the active workbook, along with the UsedRange address of each one. 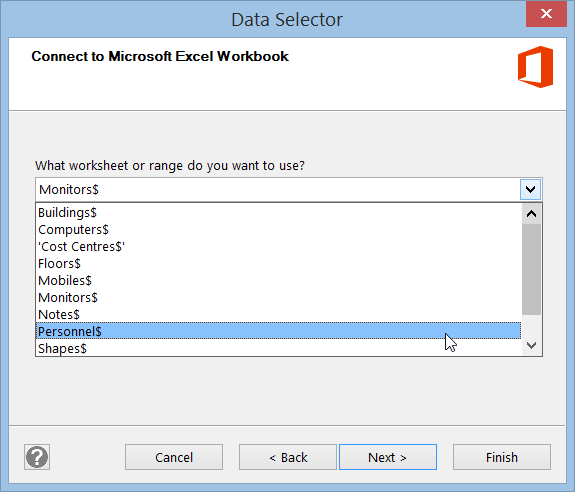 After a little investigation, along with my friend John Goldsmith ( see http://visualsignals.typepad.co.uk/vislog/ ), it became quite clear that the Data Selector in Visio was only displaying the worksheets where there was some values entered, and references the used range. 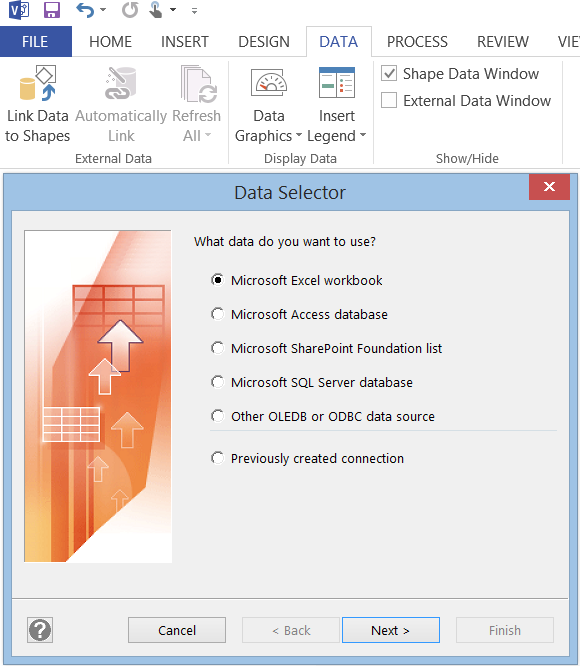 Therefore, any code that automates the transition of the DataRecordsets source from a local Excel file to one stored on SharePoint needs to observe the limitations of Excel Services. So, with those caveats, I can now change the data source of the active recordset, then run my macro, LinkExcelRecordsets, and then all of the other recordsets will be linked to the same target Excel workbook. 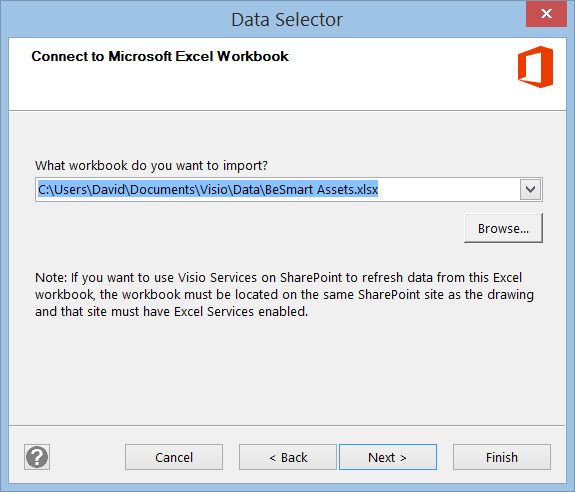 This is useful for moving Visio documents and linked Excel workbooks around together, or even sending to other users. 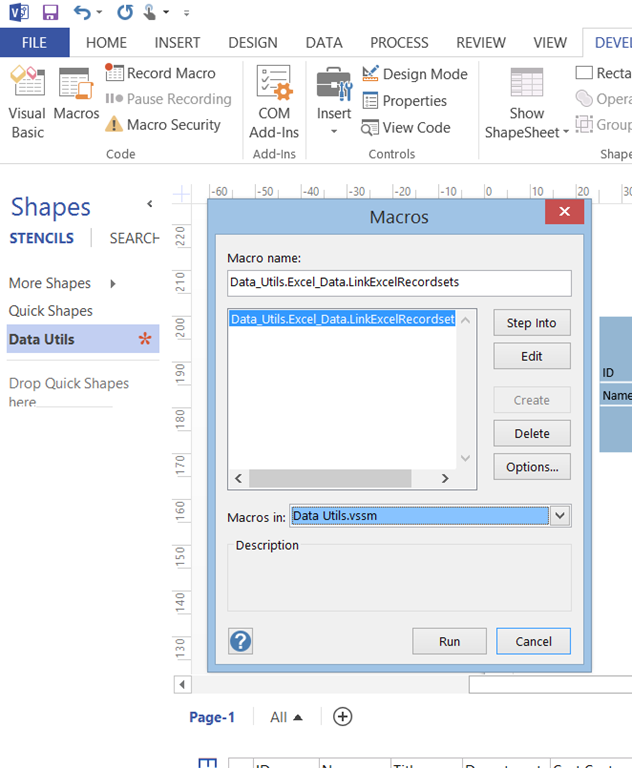 The macro is in the Date Utils.vssm file which can be downloaded and placed into the My Shapes folder, where it is available for opening when required. 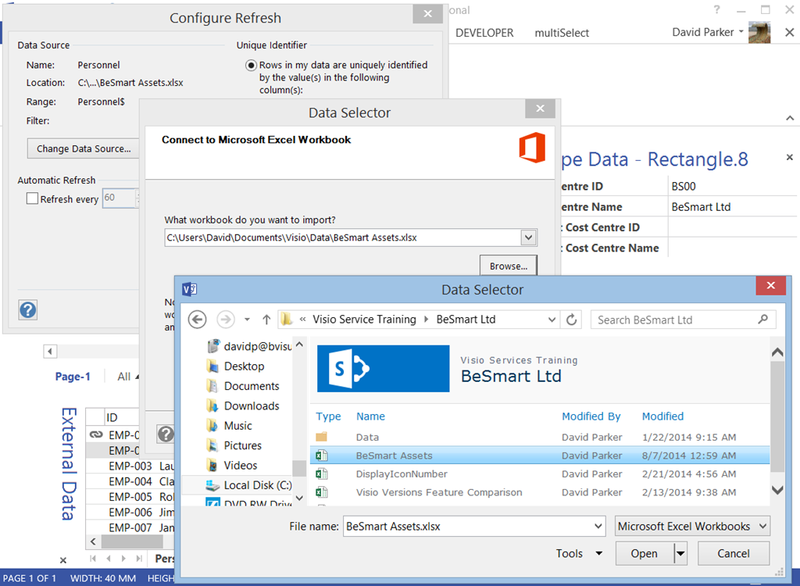 The macro just changes the DataConnection.ConnectionString and the CommandString of each other Excel linked DataRecordset in the document. Please do not blame me if something goes wrong as there is only basic error handling in the code … and always backup your important documents first!